The Converter/Extender system has two components: the 3GSDI-DVI-FOSC converter/transmitter, which connects to the SD/HD/3G-SDI video source and also supplies video to a local DVI monitor, and an optional ST-1FODVI-R-SC receiver that connects to a remote DVI monitor. The units are interconnected by a single-strand multimode SC fiber optic cable. 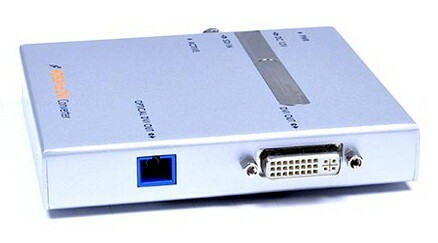 Connects a computer or camera with a 3G-SDI/HD-SDI/SD-SDI video signal to a DVI display. Signal transmission via single-strand multimode (50-micron or 62.5-micron) SC fiber optic cable - no RF interference. Auto-detects 3G, HD or SD-SDI format. Complies with DVI 1.0 standard. One female BNC connector for SD/HD/3G-SDI input signals. Input signals: SMPTE 259M-C (270 Mbps), SMPTE 292M (1.485, 1.485/1.001 Gbps), and SMPTE 424M (2.970, 2.970/1.001 Gbps). One female DVI-I single link connector for DVI output. One female SC fiber connector for optical DVI output. Relative humidity: 10 to 80% non-condensing RH. WxDxH in: 3.90x4.61x0.83 (99x117x21 mm). One female SC fiber connector for optical DVI input. 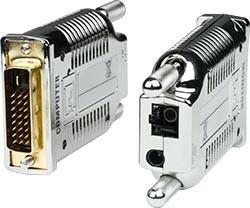 One male DVI-D single link connector for DVI output. •WxDxH in: 1.57x2.64x0.59 (40x67x15 mm). Use a FIBER-S-SCSC-50-xM (simplex multimode SC 50-micron) fiber optic cable to extend the remote unit up to 1,640 ft (not included). Simplex multimode SC 62-micron fiber optic cables are also compatible. Convert 3G-SDI/HD-SDI/SD-SDI to DVI video & extend up to 1,650 ft.